One of the most effective ways to raise horses on a limited plot of land is through rotational grazing. Rotational grazing is where you divide a field into smaller pastures for your horses to graze. This way you can control how much wear your fields are having to endure. It also prevents overgrazing in the "sweet spots" and huge areas of your field under-grazed. Fencing these pastures with permanent fences can cost a significant amount of money and once it has been divided there is no turning back without a significant investment of time, effort, and money. So what can you do? One of the easiest ways to fence areas off for rotational grazing is by using hotwire or electric fencing. These fences go up quickly and are inexpensive and can be moved and shaped to your desired location in minutes. Below: An electric fence in the form of ribbon "wire." Image Attribution: By BLW (Own work) [GFDL (http://www.gnu.org/copyleft/fdl.html), CC-BY-SA-3.0 (http://creativecommons.org/licenses/by-sa/3.0/) or CC BY-SA 2.5-2.0-1.0 (http://creativecommons.org/licenses/by-sa/2.5-2.0-1.0)], via Wikimedia Commons. There are a few things you will want to remember when using electric fencing in this way, however. You will want to make sure that you use a wide ribbon "wire" instead of a single line as it is much more visible to a horse and less likely to be run through. They are also more likely to break should your horse run through them instead of slicing through your horse's chest or wrapping around their legs. You will want to run this with a minimum of a top and bottom strand to maximize visibility although fences of 3-4 strands are preferable. Setting these fences is easy. You will want to plan out your pasture's layout before buying the supplies to erect the fencing. One easy design that requires the least amount of change is to divide your rectangular field in half with a six to eight foot "lane" down the center. This is where all the paddocks will open to allow you easy access to every paddock and reducing the number of paths being worn into your field. From there, have the field divided into appropriately sized paddocks for the number of horses you want to place in them. Once this has been designed, plan where the openings will go. This can be easily achieved by using a gate hook. Simply pull on the insulated gate handle, open the wire "gate," and then lead your horse in or out. Once this has been planned, you can determine what box will work best for you. Make sure you calculate the total fencing used, not just the perimeter, or you will have issues with a loss of voltage. This can be quite disastrous as some horses will occasionally check for a weak spot in the fencing. Once a horse has learned to run through an electric fence it is much harder to retrain them to respect it again. Setting up the fence is quick and painless in comparison to installing a traditional fence. Often a 10-acre field can be divided into ten 1-acre paddocks in the course of a day with two people. If you find one of the paddocks is looking quite bare, you can let that paddock rest and use one of the empty paddocks you have created. This type of rotational grazing ensures that your pastures are healthier, greener, and are more productive than if you left the whole pasture open. It is also ideal for horses that are prone to overgrazing or need to have their grass intake limited for medical reasons. You simply use one of the heavily grazed pastures where your horse will still benefit from being outside without the danger of overgrazing. You can also divide the paddocks to limit how much room a horse has if you need to. One useful product for dividing paddocks is the Gallagher Smart Fence. 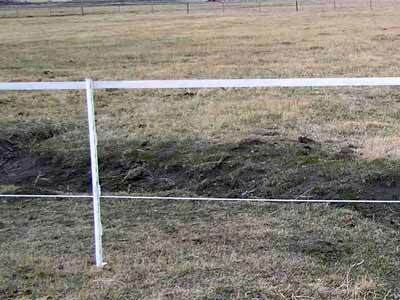 This type of fencing is appropriate for foals, mares, and geldings. It is not appropriate for stallions or wild horses as the electric current is not enough of a deterrent. They will still require a minimum of a 5-foot traditional fence made from planks, metal tubing, or other solid materials.